Miko is such a sweetie, he’s always ready for play time and/or cuddle time when I get home from work and follows me around the house. It’s hard not to feel guilty for being tired after a busy day, how do working parents do it? 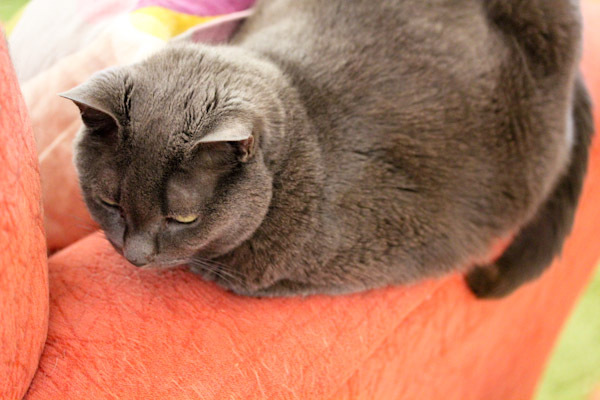 Smokey is happy to just hang around with us even when I’m feeling a little mushy after too much multitasking all day. She’s also happy to stand on my stomach in the morning to tell me it’s breakfast time. After a busy day, I’m happy to have a simple and healthy meal and I must say, this raw broccoli based dressing is a winner. I came up with the recipe on a whim to use up broccoli blending it with my favorite tangy and savory flavors and it worked. The texture is creamy with pleasant tangy umami taste and a slight spicy garlic flare for nice depth. It could easily be a fabulous hummus replacement too. 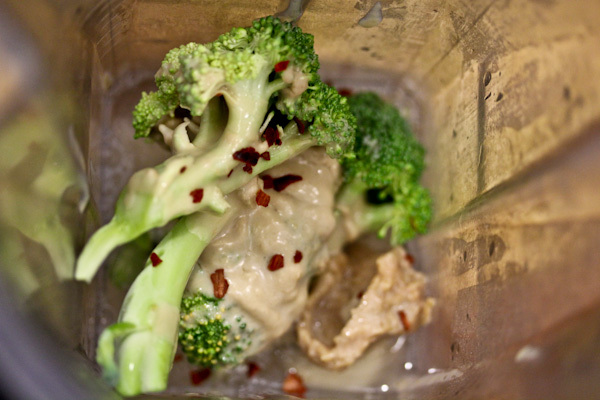 It’s always a challenge to find new ways to enjoy raw broccoli, but creamy sauces and soups are my favorite. 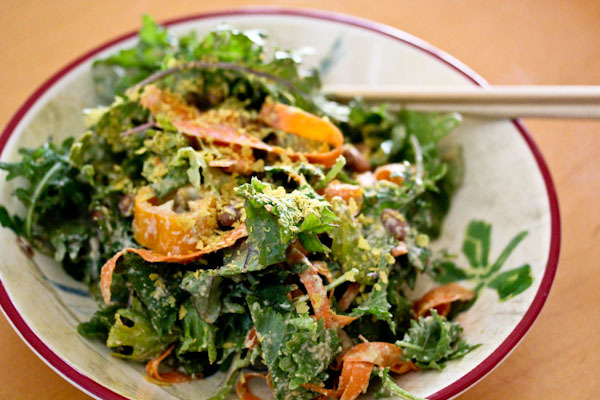 It coated a large kale meal salad with simple slow cooked pinto beans. And brought it to life with a kicky flavor. Try this! Little Miko is definitely a cutie. 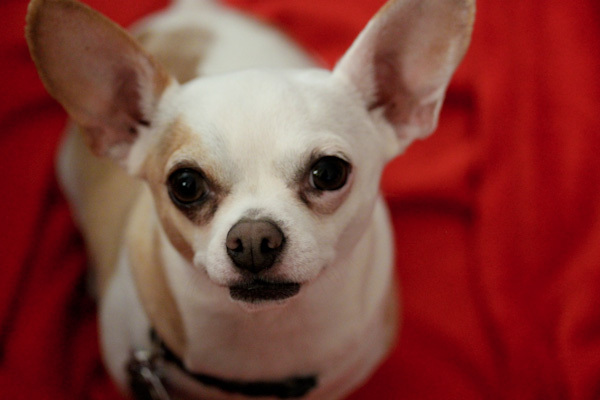 I have one chihuahua at my feet and one tucked between my back and my chair as I type this. :) I love your salad dressings Christine, this looks like another winner. Miko is such a cutiepie! Would love to try this dressing!! Thanks on Miko, he is a sweetie. Yes, try it! You could use sunflower seeds or sunflower seed butter in place of the tahini too. OKAY LOVE THIS CREATIVITY x10000! Seriously looks amazing, I must pin and try this! I love broccoli is soups too but never thought to make a salad dressing out of it. You pulled off making a creamy salad dressing that’s actually good for you ~ not easy~ And Smokey is adorable! Thanks and true on salad dressing, but tahini is a magical ingredient for that. Hemp seeds could also be used in place of the tahini to make it even healthier with more protein and good stuff, but the texture won’t be as creamy. 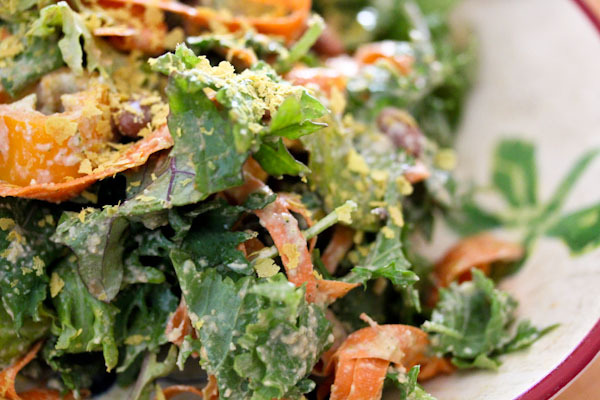 I’ve never seen anyone put broccoli in dressing before — this is sooo cool! Since I got a high speed blender, I’ve gotten really good at throwing spinach into anything I blend up, so this is right up my alley. 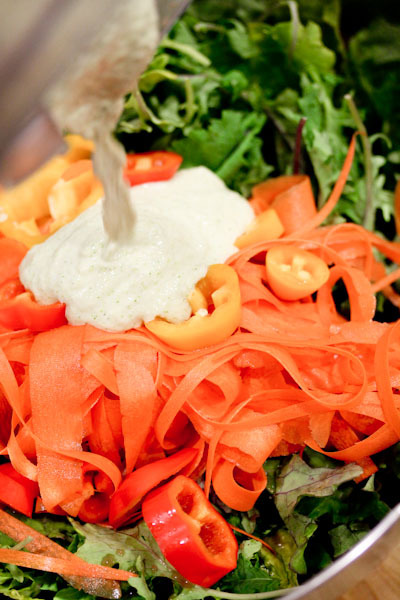 Thanks on the dressing, great blender make it so easy to stash more veggies into creamy sauce. I’ve been adding broccoli stalk to our smoothies lately and you’d never know when blended with banana and protein powder.